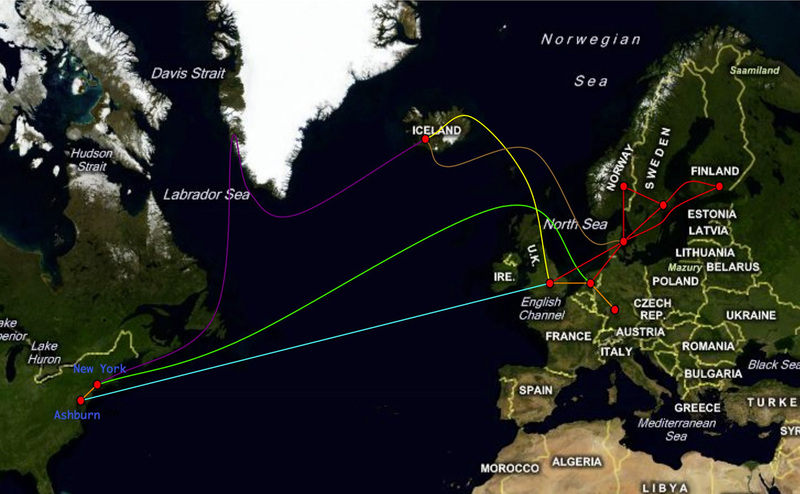 Map Showing NORDUnet's 2011 completion of network expansion by taking a third connection to the US in production. (Click to Enlarge)NORDUnet, the R&E network connecting the Nordic countries has recently undertaken a brilliant Internet peering strategy that will have global significant ramifications for supporting research and education around the world. NORDUnet is now emerging as one of the world's first "GREN"s — Global Research and Education Network. NORDUnet is extending their network infrastructure to multiple points of presence throughout the USA and Europe to interconnect to major Internet Exchange Points (IXPs). This will allow them to negotiate as a Tier 1 Internet service provider and exchange traffic with other global commercial Tier 1 Internet transit providers. NORDUnet is also playing a global leadership role by extending this service offering, on a shared cost basis, to NRENs such as SURFnet (Netherlands), PIONIER (Poland) and perhaps others. Many network operators ask why they should build an extensive peering network when transit prices are only marginally more expensive than peering (and still dropping)? The NORDUnet engineering team are one of the first to understand that Internet peering is not about cost comparison between peering and transit pricing. Most universities (as well as consumers and business) have a fixed budget for Internet connectivity. So regardless of traffic volumes they can only spend so much money for Internet transit. As result many institutions cap traffic volumes to commercial transit providers. But peering traffic is done on a settlement free basis and therefore traffic volumes are not linearly related to cost. Many NRENs have discovered that content peering traffic has a huge benefit for their connected institutions in stabilizing costs without restricting use of the network. On some NRENs, content peering traffic is now 90% of their overall traffic volume. By connecting to the major IXPs in the USA, NORDUnet can eliminate purchase of virtually all transit traffic. Traffic volumes are expected to immediately jump because now institutions will not have to cap formerly transit traffic. This arrangement will have a huge benefit for the research community as more and more computational research is done on commercial clouds in the US. NORDUnet realizes, that despite concerns about US Patriot Act, researchers are voting with their wallets and using commercial cloud providers and value added cloud providers in the US. Many research disciplines, especially genomics and bio-informatics are being increasingly dependent on commercial application providers, because they have the necessary tools critical to their research. Numerous bioinformatics companies, like SoftGenetics, DNAStar, DNAnexus and NextBio, have sprung up to as they have found life sciences a fertile market for products that handle large amounts of information. Access to these commercial organizations through the commercial Internet or Open Lightpath Exchanges is essential for the future of research. This initiative by NORDUNet will have profound implications for the future of the Internet and data intensive science. The obvious next step after exchanging peering traffic is also to use this links for dynamic lightpaths and virtual networks for large data flows. It is no surprise that networks like NORDUNet and SURFnet are also leading the developments of dynamic optical networking through GLIF. The other important development is for other NRENs to build similar global links and exchange peering routes so collectively they can represent themselves as a global Tier 1 and finally eliminate the archaic telco business models that currently dominate the Internet. This will significant benefits for those NRENs who are deploying community IXPs and can extend the benefits of content peering to community anchors and support community broadband developments. Peering traffic also goes hand in hand with dynamic optical networks and GOLEs. Some NRENs are under pressure by some large institutions threatening to leave. Some institutions think that by directly connecting to a GOLE and purchasing commercial Internet for the balance of their traffic is all they need for R&E connectivity But peering dramatically changes the balance as it is a service and business model that is not available from commercial providers. The cost savings are dramatic for the connected institution and it does not cripple researchers accessing commercial research services such as clouds because of traffic caps. Once again, NRENs and GRENs are demonstrating their important role in redefining the critical role of the Internet and creating new opportunities for the global informational economy. Kudos to NORDUnet. Local Time: Wednesday, April 24, 2019 01:00 PM PDT – Page Load: 0.2837 Sec.